Foreigner’s Tribunal Dhubri Recruitment 2018 : In pursuance of the Govt. letter No:PLB 219/2015/141 Dated 26-03-2018 applications are invited in the standard Form of Application published in the Assam Gazette Part-IX from the intending candidate & who are the citizen of India as defined in Article 5 & 8 of the Constitution of India for filling up the following vacant sanctioned posts of Grade-Ill which are lying vacant in the office of the Foreigner’s Tribunal (1st/2nd)Dhubri. The details are as shown below. 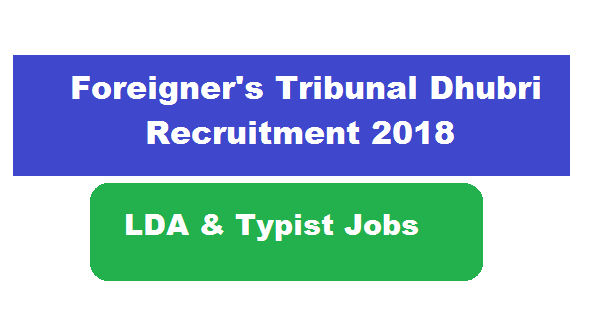 In this section, we will discus in detail about Recruitment of LDA & Typist Posts Under Foreigner’s Tribunal Dhubri Recruitment 2018 with all the details and requirements . Following are the details of the post under Foreigners Tribunal Recruitment 2018 for Dhubri District. A. Candidates Must have completed minimum Higher Secondary School Leaving Certificate (HSSLC) Examination or equivalent from any recognized Central/ State Board. PB Rs. 14003-49000 + G.P. and other allowances as admissible. A. Candidates Must have completed minimum High School Leaving Certificate (HSLC) Examination or equivalent from any recognized Central/ State Board. Application Fee: There is no application fees for the aforesaid posts as per Govt of Assam. Finance (Estt-A)Department , Dispur. Guwahali. 06 Notification No. FEG 32/2016/12 Dated 21.05.2018. Age Limit: The Applicant must not be less than 18 years of age and not more than 44 years of age as on 03.03.2018, (As per 0.M.No. ABP 6/2016/8 Did. 18.04.2018). Upper age Is relaxable as per existing Govt. norms. The application should be submitted in the Standard Fern) as published In the Assam Gazette In Part-IX in a sealed envelopes address to the Member, Foreigner’s Tribunal No, 1st/ 2nd , Dhubri (as applicable) and should be submitted in the Personnel Branch, Office of the Deputy Commissioner, Dhubri. Application should be send either through post or to delivered by hand in the drop box kept for the purpose in the Personnel Branch, Office of the Deputy Commissioner, Dhubri, P.O. Dhubri, PIN-783301. Post applied for shall be superscribed on the sealed envelopes. 2/ Candidates already in Govt. Service may apply through proper channel. shortlisted candidates selected in order of merit on the basis of written test for the post of LDA & Typist will have to appear in Hands on Computer Test. The details of the examination will be notified in due course of time. a) NO TA/DA will be borne by the Govt. at the time of Written Test/ Computer Test. b) Appointment shall be made only after police verification and Medical Examination as per procedure. c) A selection committee will be constituted to select the aforesaid posts. The Commiittee has right to accept/ reject the candidature after proper scrutiny of documents/testimonlats etc. c)The posts mall cadres are purely temporary and continue till the existence of Foreigners Tribunals. d) The employees shall have no claim to continue in service in case the tribunals are abolished.